My name is Esta. I am 38 years old and proud mother to a beautiful daughter. This is my story. A story like any other that begins with hope, swings by pain and currently builds on conquest and hope. I was brought up in a Christian household, a safe haven where we got together each evening for Bible study. We were taught the fundamentals of respect for each other and our peers. We were a naughty, busy group consisting of myself and two older brothers. Our days were filled with sunshine and teachings by a father who had the patience to answer all our questions and help with the onslaught of life’s problems. I was the proverbial model child. Homework always done on time, room neat and tidy and to top it all quiet and well mannered. My elder brother was the dreamer and the eldest exactly what you would expect – always there to help and lead. The first ripple in this idyllic state was caused with my finding out that my father had had an alcohol dependency when I was small, had been sober for a period of over 14 years, but then reached out to the bottle again in my teens. My father, as with any other daughter, was my ideal and this news absolutely ripped the world from under my feet. I felt cheated and started to get cynical about life. For a couple of years we went through periods of sobriety interchanged with periods of total surrender to the bottle. I have always been a quiet introvert, but during this time I completely withdrew from people and just concentrated on my school work. A Week after my 21st birthday my elder brother committed suicide and this brought my parents lives’ to a grinding halt. My father handled it as he would any other crises – back to the bottle. My mother, who at that stage was already close to collapse after years of support to my father, now gave in completely. Taking up the household fell to me and I took up the challenge as if I had been preparing myself for this my whole life. My only thought throughout was that I, being the dependable one, would NEVER use alcohol in my entire life. Not even socially. My family moved back to my father’s hometown, Kroonstad. I started working at a local business and met my husband at work. He was very fond of people and always surrounded by friends. Obviously there was always alcohol concerned at these gatherings and I started drinking socially. At this stage I was not concerned about my alcohol consumption, not taking my family’s history of abuse into consideration – something like that would never happen to me. Gradually alcohol started playing a bigger role in my life, but it was acceptable behavior – everyone else lived like that. No get together was organized without first buying the drinks. We were each other’s best friends and it was as if we had already spent more than one lifetime together – that was the extent of our feelings for each other. We did absolutely everything together; to be apart was never even an option. Two years after we met each other, we got married and eventually were blessed with a beautiful blue eyed daughter. She bore a striking resemblance to her father and was his absolute pride and joy. As it is the way of the world, all fairy tales unfortunately do not have happy endings – after 5 years of marriage he passed away after a routine appendectomy. Our daughter was 2 and half years old. I could not believe that God could let something as earth shattering like this happen to me. I kept my part of the bargain, why could He not keep His? Akin to a temperamental teenager I slammed the door to my heart and turned my back to Him. I did not really mind being led upon the path of reliance upon alcohol to get through the day. I had the excuse of drinking to relax, to pass the time, to get through the lonely nights and to lessen the pain. With time, the monster of dependency took me securely into its grasp and dragged me into the abyss of pain, anguish, self loathing, anger, deception, sorrow and depression. No other colour describes this situation more vividly as darkest deepest unbroken black. My life was not worth anything anymore, not even the love for my daughter was enough to break the chains of alcohol dependency. Like many before me, I hid my problem, but the truth will always come to the light. Unfortunately no one else could break with this destructive lifestyle except me. At first I stubbornly believed that I most definitely did not have a problem. Everyone was exaggerating. I only drank at home and therefore was no hindrance to anyone. How could anyone think such a bad thing of me? Throughout all of this, the Lord never let go of me, even if I thought so. After nearly 4 years of destructive behaviour, the last few months being the worst, He took pity on me and brought about a chain of occurrences that would lead to my escape. I quit my job and managed to find a position in another business in town. Here my life made a 180 degree turn. My new employer is an active Christian, glowing with the love of Jesus. When I owned up to my situation after only a month of employment, he did not show me the door, but declared himself willing to stand by me on the road to recovery and freedom if I was willing to stay on that road. During that same period, I moved to another house and it was as if the Lord was assisting me with accomplishing a complete break with my past. I did not see any of my old acquaintances anymore and did not have contact with anyone from my old life. 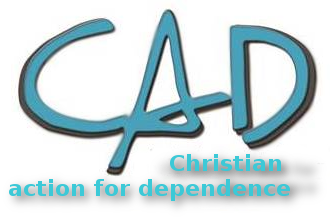 I immediately got involved with the neighbourhood congregation and started to attend the CAD meetings weekly. The road to sobriety was not an easy one. I struggled with breaking the abusive routine, but after managing to withstand the last temptation by being absolutely pro active, the circle was broken. Such is the greatness of Jesus Christ in my life that, after the last resistance, I have never again craved alcohol. During the first few months I kept myself so busy with an array of tasks that I fell into bed each night, utterly exhausted, just to break the old routine of reaching for a glass the moment I walked into the house. I started building a relationship with Jesus, such as I never had before. Through all of this I took it upon myself to attend our local CAD meetings on a weekly basis. Each time I got home from a meeting I was recharged and once again ensured of the direction my life was taking. My daughter even commented that I was so friendly and happy when I got home after a meeting. Once again, from a child was given the endorsement for my “new” life. Today my slogan is: Been there, done that, ain’t never gonna go back. Life isn’t suddenly all fun and games, but the palpable involvement of my God in my life ensures me that I am doing the right thing and gives me the courage to face life as well as giving me hope for the future. Nothing in this world is worth going back to a life of dependency. Life without alcohol is enjoyable, free and full of promise.